MOSCOW - Walking on crutches at the Rostelcom Cup of Russia awards ceremony on Sunday, two-time Olympic men’s champion Yuzuru Hanyu has indicated he intends to skate at the ISU Grand Prix of Figure Skating Final starting from Dec. 6. 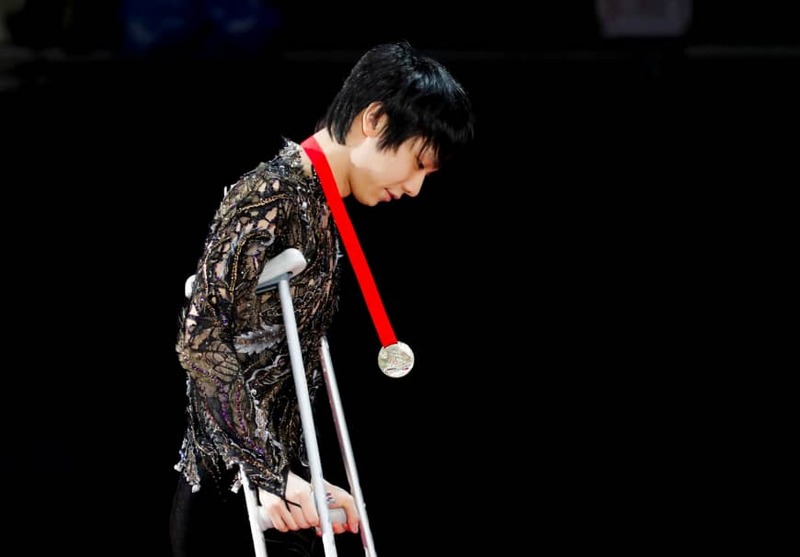 One day after winning his second championship of this year’s Grand Prix series, Hanyu appeared at the ceremony dressed in his free skate costume but moving on crutches, and was showered with applause. 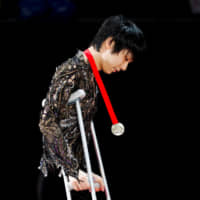 According to Kobyashi, Hanyu was diagnosed with apparent damage to two different ligaments, a tendon and his fibula, and the ankle swelled up overnight. “The affected areas are being iced repeatedly and he is keeping his leg elevated,” she added. Considering his past, it would be hard to rule Hanyu out of the Grand Prix Final, which he has won four times. In 2014, he was injured in a crash at the Cup of China in early November, but bounced back one month later to win the Grand Prix Final. His second Olympic championship this past February came after suffering bone and tendon injuries last November.